Alluvial deposits on the Lagudarsi Stream [at Kioto], Spitti. bl.uk > Online Gallery Home	> Online exhibitions	> Asia, Pacific and Africa Collections	> Alluvial deposits on the Lagudarsi Stream [at Kioto], Spitti. 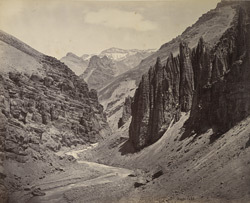 Photograph of alluvial beds in Spiti, taken by Samuel Bourne in the 1860s. Spiti is situated at Upper Sutlej at a height of 10,000ft. This view shows curious gravel formations on the Lagudarsi Stream at Kioto, Spiti, a result of aerial degradation.